All our invitations are printed on a 130 pound(#) premium card stock. 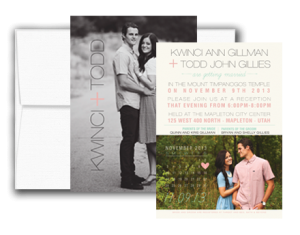 To compare, most low-cost wedding invitations are printed on 80# card stock; however, at Utah Announcements we think you deserve both affordable prices and high quality paper! If you have any questions or need a more custom order from what you see below, Contact Us or call 801-810-6065. No payment is required until after your design is approved and ready to print. Prices do not include sales tax, which will be applied to orders sent to addresses in the state of Utah. Click here to see our printing turnaround times. Also available by quote: Folded 5×7 Invitations, Folded 4×6 Thank You cards, 4×4 Inserts, Gold Foil Printing, Pearl Paper, 4×9 Menus, and more! Click here to request a quote. Wedding invitations and announcements should be a simple and fun step in planning and preparing for your wedding. You need fully customizable wedding announcements from Utah Announcements to announce your special day! All our designs are created to match your wedding colours, style, and theme. After you find the wedding invitation designs you from our portfolio(add a link to this word) or other websites, our qualified and experienced designers will give you the wedding invitation you are guaranteed to love. We can ship our Utah wedding invitations and wedding invitation envelopes anywhere in the United States. We believe Utah wedding invitations should be affordable and we constantly stand as the lowest cost for wedding invitations for the highest quality in Utah. We have the best pricing around and we promise to make the process easy and enjoyable. 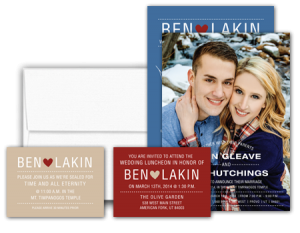 Utah Wedding invitations inserts can be used for a wide variety of announcements, including the following: ceremonial invitations, registry information, map and direction inserts, or a luncheon invitation. 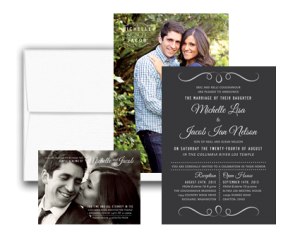 Wedding invitation inserts are custom designed along with the wedding invitation to have a uniform and consistent design. The typical wedding insert size is 2.5? x 3.5?. These inserts will help you send your special message in a classy and elegant manner! After your wedding, you are probably feeling grateful for all the gifts and support you received for your wedding. Thank you postcards are a great way to send a personalized thank you to all those who supported you in your wedding. 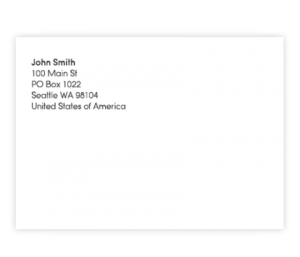 Custom thank you postcards typically include a picture of you and your spouse or partner with a simple thank you message on the front, with a postcard layout on the back for your personalized message.